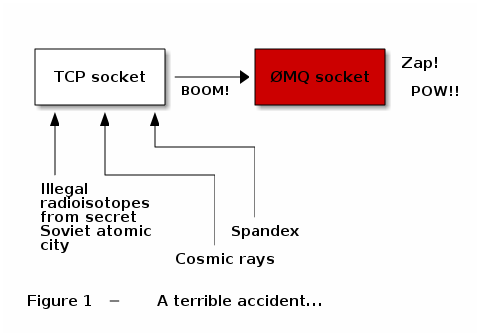 A ØMQ socket is what you get when you take a normal TCP socket, inject it with a mix of radioactive isotopes stolen from a secret Soviet atomic research project, bombard it with 1950-era cosmic rays, and put it into the hands of a drug-addled comic book author with a badly-disguised fetish for bulging muscles clad in spandex. If you are using ØMQ sockets already, congratulations on your purchase! If you are still struggling with products of the past, rather than the future, you will now find An Introduction to ØMQ has morphed into Chapter One of The Guide. Enlightenment guaranteed, or your money back.